Well I finally have time to sit for a few minutes and check in with your guys. I apologize for not having any great stories or long accounts of the show, but I really just wasn't feeling it. I feel like I've been in a race since I came back from Virginia and really just wanted to do something fun and relaxing and the horse show was anything but. Thursday I got ready for the show most of the day because were were shipping out Friday late morning. I got all my tack cleaned and horse clean and everything packed. My back was killing me by the end of the day but it felt good to have it all done. I then went home and got all of my stuff together for the most part. That night I went to the local fair with a friend to hang out with some of the bull riding people that had come into town. I ended up having so much fun. They were primarily from Minnesota and Iowa and what a great bunch of people they are! I didn't want to leave. We were laughing and joking and just having a great time. I didn't go to bed until the wee hrs of the morning. I had my roomie load Possum on the trailer the next morning so I could have an extra hr of sleep and then she came back to the house where I helped her hook up the camper. I then got ready and packed and had to drive the one hr in the opposite direction to drop off my dogs, then went to the barn and loaded my car with the stuff I had packed the day before and then hit the highway to meet up with the trailer and my roomie at the show. It was just about dinner time when I arrived. I checked in on Possum and put some mats in his stall and fed him and gave him a quick grooming. I got my stuff ready for the jumper portion of the show and hung for a little bit in the barn and then went to the camper to sleep, since I was beat. I got up early the next morning and cleaned his stall and fed him breakfast and then took a shower and got changed in my riding gear. The show Saturday was soooooo slow. It was about 1pm before I finally was able to ride in the first jumper class. Possum had a great warm-up and felt good on that hind leg, but I also didn't want to push it. We had some good rounds in the jumpers. I can't remember off the top of my head what we placed, but it was fairly good. By the end of the day I was tired and cranky because it had been a hurry up and wait situation. I took care of Possum and then decided that I would drive the hr and a half back home that night to meet up with the cowboys for the last time since they were shipping out Sunday morning and I had a little crush on one of them, the one I stayed up till 5am talking to. I really wanted to spend a few more hrs with him before he went home to Minnesota. I took care of Possum and then hit the road. I got home about 8p and took a quick shower to wash off the days dirt and headed to the fairgrounds. It felt nice to walk up to the large group and have everyone yell my name and give me big hugs and excited to see me, I have to admit it made me feel good. We hung out and then went to a local bar. I didn't drink since I had the show in the morning to drive back to. My classes were last of the day so there was no huge rush, but I still wanted to feed and make sure everything was ready and I also had to polish my boots. So I was the DD at the bar, but I still had a blast. I danced basically the whole night, moving from one cowboy to the next. They were such great people and so respectful that it was a breath of fresh air to hang out with them. They definately stuck out like a sore thumb in our small town or locals but they just took it all in stride and if someone was ride to them they just brushed it off. I got home about 2am and slept till almost 7am. I packed up and took a shower and was back at the show a little after 9. The day was just not that fun. Our barn for the most part did excellent and that was great and I was happy for everyone. I had a good warm up on Possum and then when it was my time to go in the ring for our first eq class it went fairly well. Not great but ok, but we still ended up 4th out of 4. The medal class was pretty much a wash. I was a little nervous and ofcourse Possum picked up on it and started to get strong. We got some bad spots, he was rushing in the corners and lost his hind end lead. I was so nervous that I wasn't blinking on course and my contacts were drying out and almost fell out of my eyes, so I basically did the second half of the course with my eyes shut. I tried my hardest. Tight legs, sitting back and using my body to try and slow him. It was so bad once that he lost his hind that I had to wrestle him to a trot to bring him back. I ended up with a score of 50 which is pretty crappy and placed 3rd out of 4 and didn't even get a call back to do the second test. I was pretty upset and had to fight back tears. I've realized that I really need to sit and think about what it going to make me happy. I have never loved showing, but it's getting to the point that I'm starting to hate it. It's a lot of work and money and if you don;t like doing it, it's gonna make you miserable. I don't really know what is going to happen, but I feel like a break from showing is necessary. If I'm not into showing, my horse sure as hell is not going to be into showing. As it is is he puts up with it because I wanted to do it. I think this fall we're gonna take it easy. Hit up a lot of the trails and just have fun and spend time together. Get out heads and bodies straight and then maybe make a decision. I'm kinda down today, not in a bad way but I kinda miss my new friends, especially the one that I had gotten close to. Just a real great guy who is a sweetheart and very genuine. He's not a super model or anything, but once you start talking it's just so easy and smooth. I'm glad that I got to be friends with them and have a lot of their numbers so if their up this way again we can hang out or something. SO I'm back at work adn the daily grind, sitting here thinking what it would be like in Minnesota hahaha. Everyone has horses and farms and all that good stuff. We stayed up late a few nights just talking about the west and how different it is from the east and the people. It makes me wonder sometimes. Well I think that;s about it. I don't have any pics right now and to be honest they wouldn;t be that great anyways. I'm glad to be home and have some time to relax and settle back into the routine. I have a late presentation at the local college tomorrow night so I won't be able to go to the barn, but hopefully Thursday I will. Glad you're back and in one piece. I guess if it's not fun anymore, why bother? Must be time for a break. I moved from PA to TX in 1981 and never looked back. Whenever anyone asks me why, I tell them to listen to the Dixie Chicks song "Wide Open Spaces." My favorite line is, "Room to make her big mistakes." That about says it. Well I am sorry you had a crappy class - those can really get you down, I've been there. I was thinking about you the whole time hoping you were doing well and ya know - maybe you do need a break. I know even though my break was forced upon me via lack of money - it has been great for letting me experience things that I have to miss because of the time and money I devote to showing. Glad you met a cowboy too (wink, wink)! I'm very sorry the show wasn't fun. I had that show in June and I almost didn't show last weekend because of it. But like my Grandma used to say, "This, too, shall pass" and don't forget the only thing that stays the same is that everything changes. I spent my first 28 years in MN and it's hard to think of it as West, and not everyone has a farm, though I'm sure more so than the area you're in. I'm guessing your cowboy is from somewhere in the western part of the state? There weren't many cowboys anywhere else, at least not real ones, but I was one of very few who rode English. I'm glad they were nice guys. "Minnesota Nice" after all! You two look good in your picture! Silly Pony, your correct, he is in the south western part of the state, I guess fairly close to Sioux Falls SD. The others that I met were either from there or Iowa. Just a great bunch of people with great additudes and outlook on life. From what I hear english is not a seat ridden much in that state, wouldn;t they love to see me coming in all my fancy english attire and tack hahaha. In terms of farms in Maine, not so much. We have horse farms and such and maybe some dairly farms, but definately small compared to the western part of the country. I'm from SW Minn. Small world. 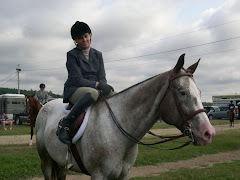 Most of the shows I went to had half a dozen or less English (and they'd run hunt and saddle seat together!) riders and tons and tons more western pleasure and games. 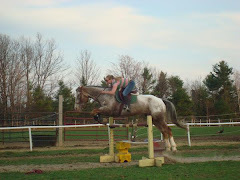 I was the only kid I knew who rode primarily English and just faked the rest. Usually it was the other way around.